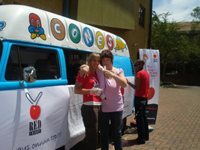 The team at Red Cherry came up with a unique idea to surprise clients with delicious soft serve ice cream, old school style. Every Friday, the “Cherries” got dressed in “Cherry gear”, packed their banners and headed off. 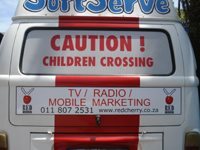 Red Cherry also decided that this year they would do things a little differently in that, no Christmas presents would be given to clients, instead they would “help the man in the van”. 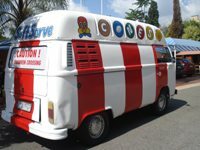 Chief, the ice cream man got his ice cream van resprayed in Red Cherry's colours (red and white) and would also get the van fully serviced so as to ensure that the ice cream van would be around for many more years to come!